MULTI BRIGHTNESS LIGHTING: Great For Different Lighting Needs, When You Need More Light. 5 Levels Of Brightness. Mild To Bright. Touch Sensitive Dimmer. 550 Lumens. LOW PROFILE RECESSED LEDs: We are the only company that offers patented recessed LED's on this design of lamp. The competition has visible LED's that are hard on the eyes. Our recessed LED's are subtle and not as harsh on the eyes. 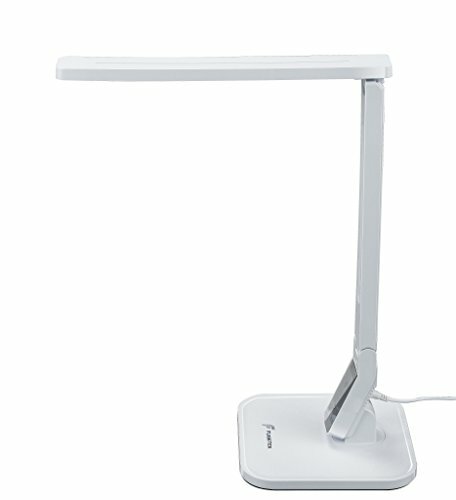 LONGEST LIFE LED: Our Lamp Uses A LED Bulb That Will Last For Up To 50000 Hours Under Normal Use. UL Certified Power Adapter. Economical, Reliable, & Energy Efficient. Power Consumption At 11W. TOUCH SENSITIVE DIMMER & TIMER FEATURES: Easy Touch Activation & Dimmer. Turn Light Off Automatically With 1 Hour Auto-Off Timer. *Unit Uses AC Adapter For Power. Not Wireless. SLEEK & SPACE SAVING DESIGN: 15" High Modern Simple Design, Yet Great Looking. Can Be Used Anywhere Space Is An issue, But Quality Light Is Needed. Ability To Fold And Put Away For Easy Storage. Uses AC cord for power, not pictured.